Most people don't think of staph infections as deadly, but I have experienced otherwise. In September of 2003, my mother came home from work with a small cut on her left knee. Thinking nothing of it, she put a bandaid on it and went about with the rest of her week. While she thought her cut was healing, it was actually getting worse due to the presence of a bacteria called Staphylococcus aureus. As her knee began to swell, we realized this was no ordinary cut. When the swelling spread to her upper thigh, she was admitted to the hospital and immediately began treatment of antibiotics. With no sign of healing, the staph infection was only getting worse. Eventually it spread to her abdomen and my three brothers and myself were told to prepare for the worst possible outcome -- death. Since as far back as I can remember, my mother has always been my rock, my mentor and my role model. Imagining life without her seemed impossible. So as the weeks passed on, I slowly began to accept the likely possibility that my time with her was limited. As we began to make larger plans for the future, we decided to try one last treatment. In January of 2004, my mother switched physicians and was put on a new antibiotic. To everyone's amazement, her health slowly improved as time progressed. A few weeks later, she was 100% recovered and returned to our home in Massachusetts. As possibly the most valuable life lesson I have ever learned, I have since never taken my mother for granted. 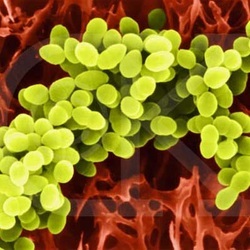 The dangerous truth about staph bacteria is that anyone can fall victim to its attack. It is so important to keep wounds clean and to be careful in every type of work area. Staphylococcus aureus is everywhere and nobody is safe for sure.